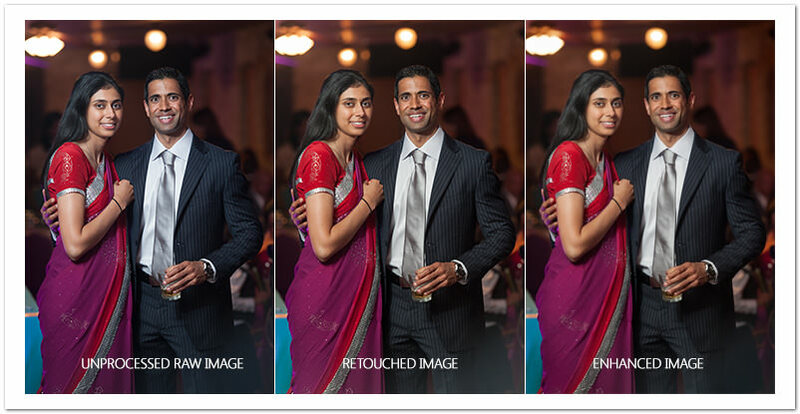 “Image Retouching” is often a loose photography term defined differently by photographers. We define it as editing an image for exposure, color correction, cropping (if needed), sharpening and other various tweaks. Each Collection includes a set number of “retouches” (based on length of venue). Additionally, there are “enhancements” which require much more time for each image and in addition to retouching include: black/white/sepia conversion, airbrushing (if needed), textures, dodging/burning, etc. We do not make images look fake by over-processing the image (i.e., too much skin softening to the point where the face looks plastic). Even though retouching is an important part of the process, the key is taking good images at the time of capture with proper composition, exposure and in-camera metering so minimal post-processing is required. Doing it right with the camera is the real challenge and it takes experience to truly master this. In the image below, the picture was originally taken with off-camera flash and properly exposed. However, due to mixed lighting and colors, the white balance was slightly fooled and there is a purple color cast. In the “retouched image,” color was corrected, exposure fine-tuned, and the image was sharpened. In the “enhanced image,” the shadows were lifted, flash “shine” was reduced on the faces, the forehead vein was airbrushed, lens distortion minimized, a slight vignette was added and minimal skin smoothing was applied to improve the complexion of the faces.